Well, Christmas has come and gone, New Years has come and gone, so if I don't post the decorations that were up for last Christmas then it just may be Hallowe'en before you know it! Looking into the living room from the hallway, I love the mix of colours and textures, it is pure visual overload. 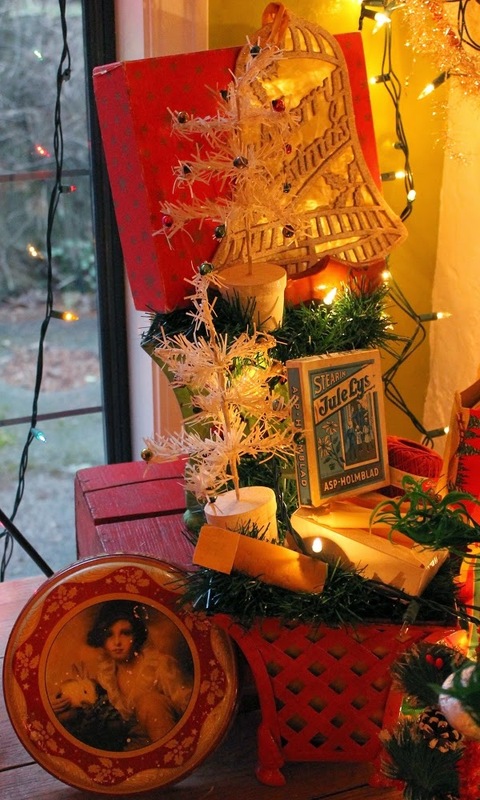 Our live Christmas tree is decorated with a mix of vintage and handmade decorations. In early December we hosted a party for our son and his wife, lots of our friends were there as well. 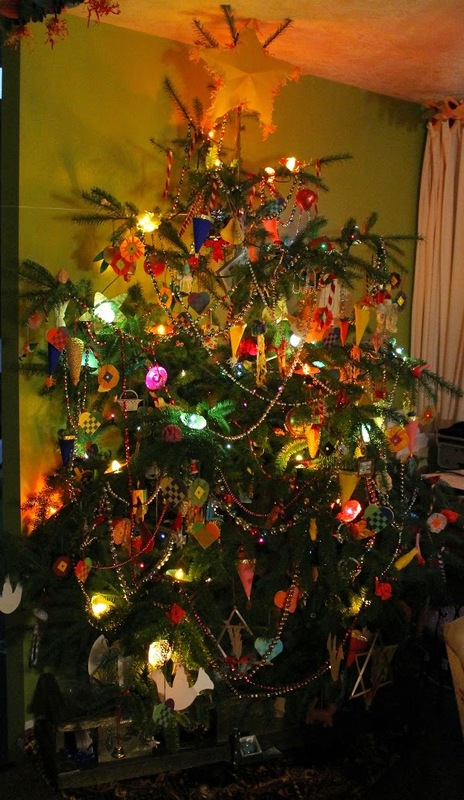 I was talking to one person and mentioned that the glass garlands on the tree were old. She and a few other people were quite surprised that they were glass, they were only aware of the plastic reproductions available today. 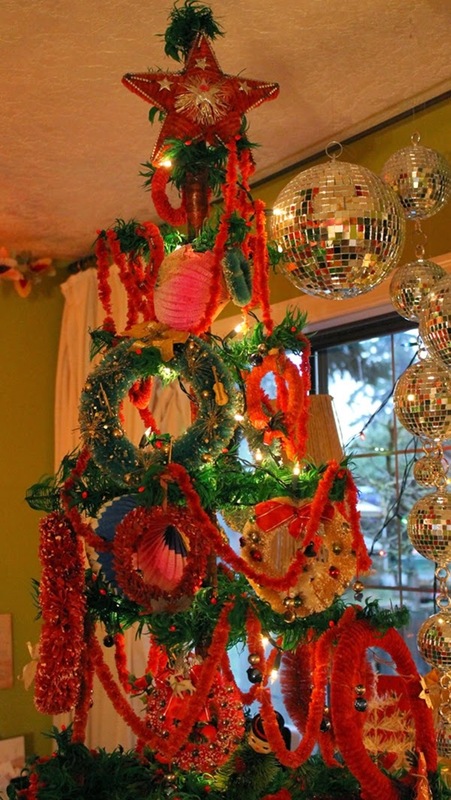 This year I decided to put up my collection of bell swags and wreaths. I had no idea that I had so many wreaths! There were enough wreaths to decorate two vases on the mantle as well as decorate my six and half foot feather tree that I made years ago. This is the left side of the mantle I am not a purist when it comes to decorating, those mirror balls are awesome. I wish that I had a light that would put a focused beam on them so that we could have spots of light around the room! There are foil wreaths, foil and cellophane wreaths, and some of the smaller bell swags hanging from the branches in the vase. 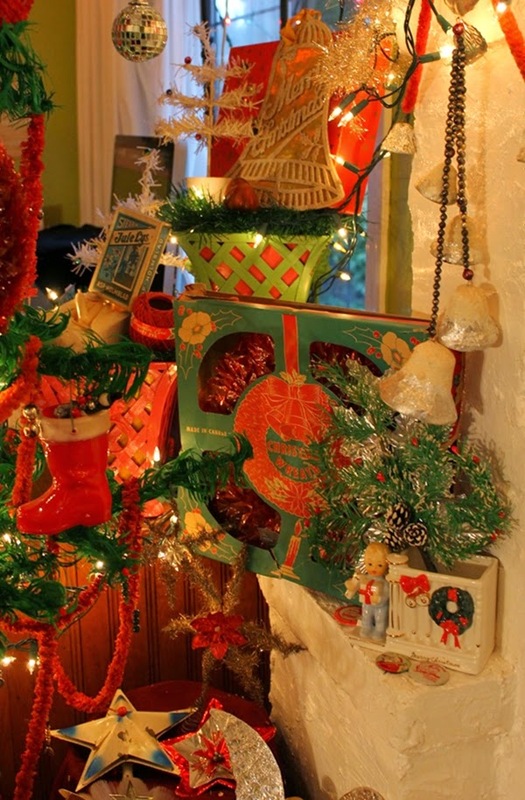 This picture shows the right side of the mantle with more cellophane wreaths, foil wreaths, and plastic wreaths. The large wreath on the wall is one of my favourites, it is covered with chalkware Santa faces, chenille guys, and cotton headed characters. Here is a close-up of some of my favourite Santas and snowmen. The glittered little guy with the puffed up cheeks is a candy container. The snowman beside him is French. The little guy between the snowman and the skier is a wooden party whistle, unfortunately his nose is missing. The tall skinny plastic Santa behind the gnome ringing the bell is a pop-up toy: push him down and his head shoots up about twelve inches on a paper tube and then settles back to rest on his shoulders. In front of the Santas in sleighs is a salt Santa that belonged to my mum. I came across two of these horse shoe wreaths several years ago and gave one to a collector friend for Christmas. The stars on either side are cardboard covered with glittery white sand. 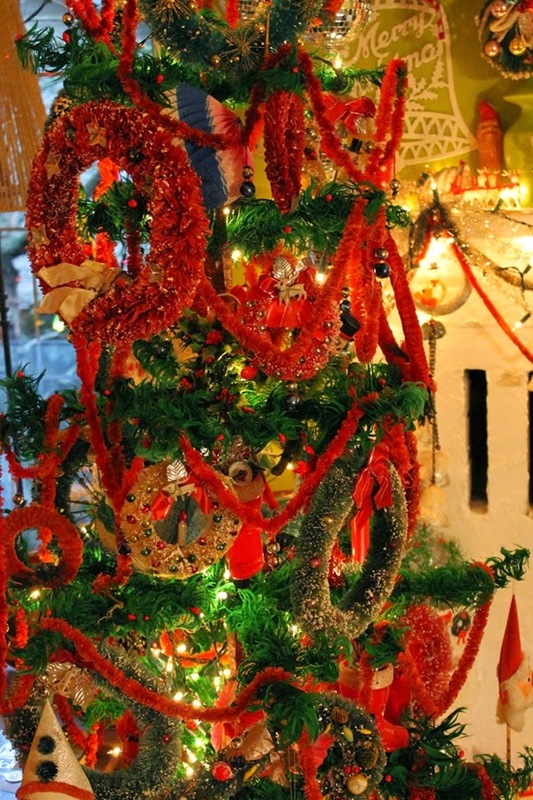 Here is the bottom section of the feather tree, the large red wreath and the garlands are made from rice straw or the leaves I can't remember which. There are lots of bottle brush wreaths and cellophane wreaths as well. The large red wreath at the top left hand side is the same as the finer rice leaves/straw roping and wreaths but it looks like it is made from very coarse but softish rice leaves. 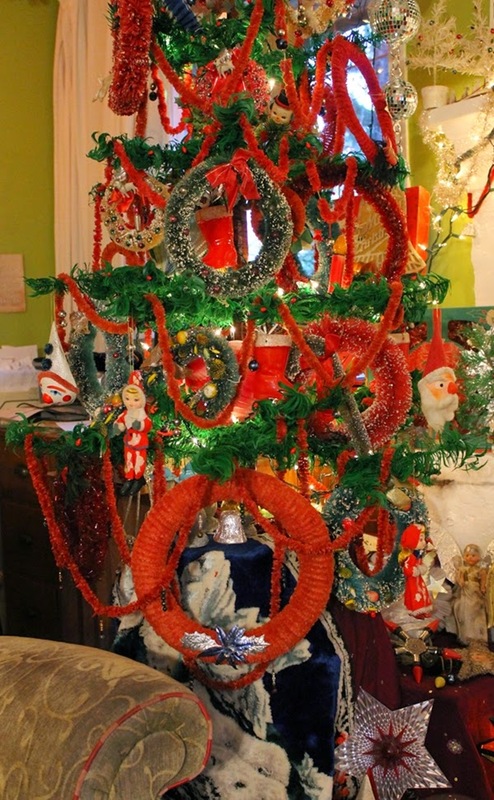 The star at the top of the tree is wrapped in narrow rice straw roping as is the wreath at the bottom right side of the picture. There are fold out paper lanterns tucked in the tree that were a gift from a friend one Christmas. In behind the feather tree I put out my collection of tree topper angels and stars, the large glass star lamp is there to stop kids from handling them. 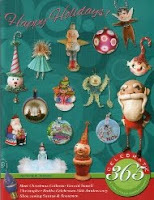 I have more tree toppers in boxes but no room to display them. Here is a close-up of the ledge on the fireplace. There is a boxed cellophane wreath, I have other boxed wreaths but as I mentioned above I have no room to display them. In front of the wreath is a 1948 florists vase. The vase was bought for me as a new baby, my brother has one for his first Christmas as well. At the base of the vase are three pin-back buttons. This was beside me at my computer. The piece of brown paper tape with the white piece of paper attached to it was from our daughter when she was very little. She drew a picture on the white paper and written on the brown paper tape is "Mare (merry) Christmas Dad", one of my more treasured pieces. Tucked in behind the feather tree is my computer and chair, it was very crowded but cozy. The room was like an Aladdin's cave.